Subsurface Investigation Services - Southern Earth Sciences, Inc. : Southern Earth Sciences, Inc.
To support Southern Earth Sciences, Inc.’s geotechnical and environmental exploration objectives, SESI is staffed with experienced crews and equipped with a variety of subsurface investigation equipment including truck-, track- and barge-mounted drilling rigs, cone penetrometer testing rigs, direct-push and vibra core rigs. The Southern Earth Sciences, Inc. cone penetrometer system is designed to provide high quality geotechnical, and hydrogeological, in-situ soil properties. Our 20-ton capacity truck and track mounted CPT units have a climate controlled operations center for maximum production, regardless of weather conditions or time of day. The 20 ton heavy-weight, track-mounted Penetrometer system is a self propelled hydraulic remote controlled CPT system designed for rough terrain or areas where low ground pressure is required for vehicle access. It has two double hydraulic cylinders coupled by a platen that pushes and pulls digital cones and other tools. It is powered by a 130 Hp diesel engine. The unit is equipped with hydraulic leveling jacks and a climate controlled operations center. The contact pressure is approximately 6 psi. The 20 ton truck CPT rig is an ideal vehicle to provide quick, cost effective mobile platform for high production in geotechnical and environmental soils investigations. This system is equipped with 5 and 10 ton seismic piezo cones and vision cones. The operations center is climate controlled for maximum production, regardless of weather conditions or time of day. 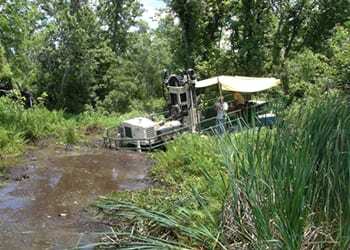 SESI’s CPT system has the capability to be mounted on a marsh buggy for access in swampy conditions. 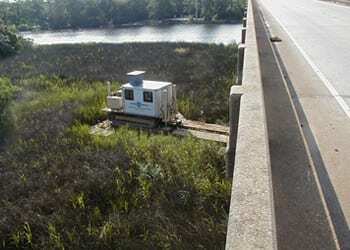 This setup has been extensively used in south Louisiana for exploration work associated with bridges, pipelines, levees, etc. We have performed CPTs from marsh buggies to depths over 100 feet. The BK-51 is a versatile drill platform with a very low contact pressure of approximately 3 psi. 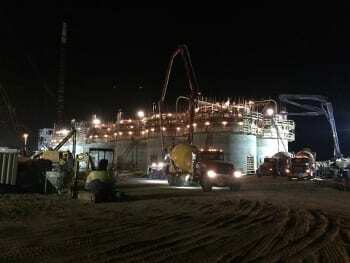 The rig can be configured with augers, mud rotary or NQ wireline. This rig is mounted on a four-wheel drive vehicle and is equipped with flight augers, hollow stem augers and mud rotary equipment. Typical borehole depths are up to 120 feet. The CME-45 is mounted on a four-wheel drive vehicle and is equipped with flight augers, hollow stem augers and mud rotary equipment. Typical borehole depths are up to 120 feet. The Diedrich D-50 is a very versatile drilling rig and has a very low contact pressure of approximately 3 psi. This particular rig can be configured with augers, mud rotary or NQ wireline. In addition, a Gardner Denver displacement pump is utilized for advancing large diameter boreholes to depths of 200 feet for 4” diameter by 4’ long tube samples required for the Corps of Engineers (COE) levee projects. This rig is mounted on a two-wheel drive vehicle and is equipped with flight augers, hollow stem augers, mud rotary equipment and NQ wireline. 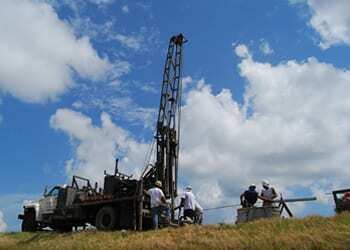 Typical borehole depths are up to 120 feet. 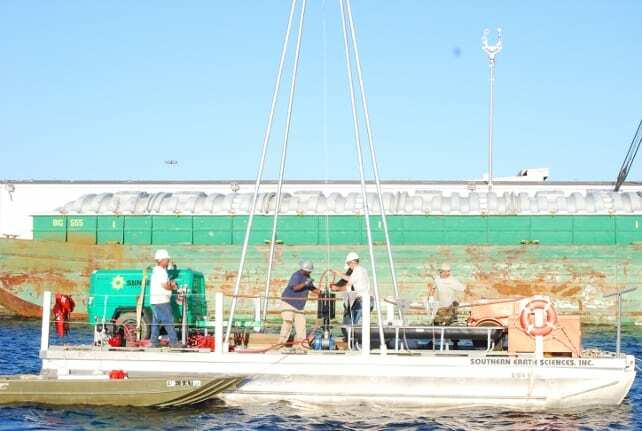 SESI’s 35 foot by 12 foot barge mounted drilling equipment is utilized for projects requiring subsurface investigations over the water. 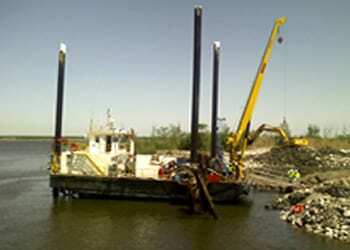 The Diedrich D-50 mounted on the barge is capable of borings in excess of 200 feet. 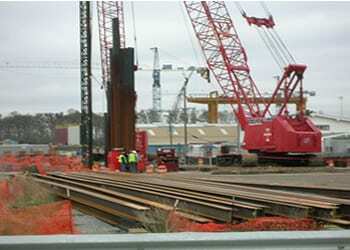 The tripod equipment is used in sensitive environmental areas to minimize the impact of drilling operations. 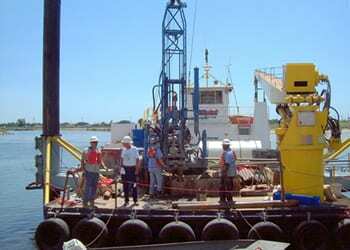 The equipment is manually operated to depths generally less than 100 feet. Standard penetration tests, Shelby tube samples and vane shear test can be performed using the manual equipment. Our drilling and CPT equipment can be mounted on a Jack-Up barge for offshore projects where there is excessive wave action. Borings and CPT penetration have exceeded depths of 200 feet in areas where the water depths may be 50 feet. The Geoprobe 6625 CPT is a self-anchoring multi-purpose push platform. 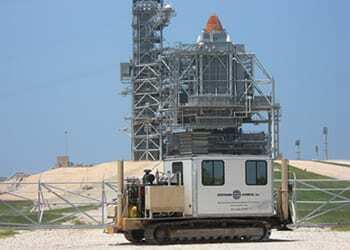 The system has 20 tons of push capacity when anchored even though the equipment weighs less than 5 tons. The system is capable of collecting CPT data or can be switched to conventional “Geoprobe” mode for MacroCore soil and groundwater sampling. SESI’s 3-inch Vibracore is barge-mounted and consists of a submersible pneumatic vibrating motor attached to a four-inch steel casing with an internal clear acrylic sampling tube and is capable of sampling up to 20 feet. Click here to download equipment list.